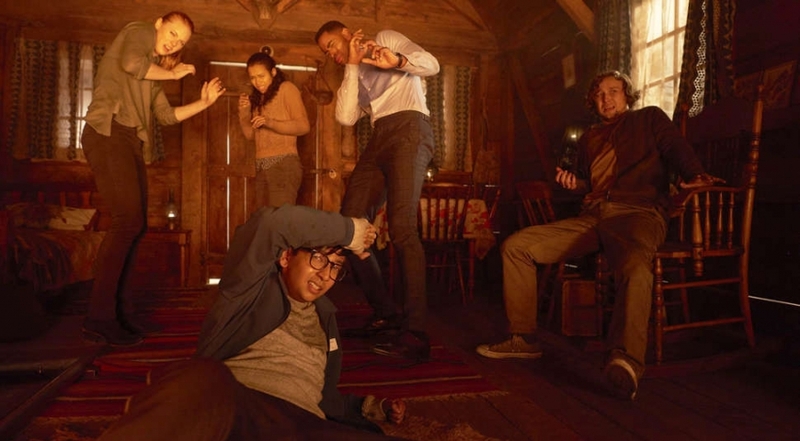 Six strangers, Zoey, Ben, Amanda, Jason, Mike and Danny receive puzzle boxes in the mail which they have to solve to access their entry voucher to Minos Escape Rooms where a $10,000 cash prize is the reward to the winner who solves the rooms. They arrive on the material day and are ushered into a waiting room where an automated recording instructs them to wait for assistance. Growing increasingly impatient, Ben asks to leave, but they soon realise the waiting room is part of the game when Ben breaks the door handle, revealing an oven dial. It is at this point that the incessant cacophony of screams to ‘look for clues’ begins, and continues for most of the movie. As the movie progresses, the true intention of the game becomes clear when the participants realise the rooms are tailored to mirror a trauma from their lives. The Rooms. Escape Room draws its suspense from the mystery of what lies behind each door they open, and the surprise was worth it every time. The attention to detail and a recurring clue that might be the piece that solves the puzzle, is a tantalizing incentive to keep you glued until the end of the film. The characters were poorly developed and Zoey and Ben are annoying. But then, you probably don’t watch films like Escape Room for character development. There isn’t much gore for it to pass a horror flick. The death scenes are terribly underwhelming. The CGI in the first escape room was so bad. The climax is ridiculous. The game master’s explanation about the existence of Minos Escape Rooms left me conflicted about whether to laugh or cry at this zero effort at developing Escape Room’s resolution. Movie courtesy of Westgate Cinema.